Upper Quarry Cascade is a terraced ribbon cascade. Its height is 4 metres (13 feet) and its crest measures 1.2 metres, or 4 feet. It experiences impressive flow during seasonal storms and after winter snow melt. 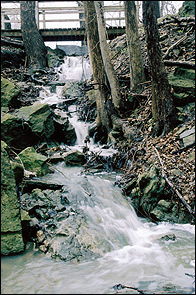 Upper Quarry Cascade is on a Grindstone Creek tributary which originates in the former quarry site east of Clappison Corners. The Bruce Trail crosses over the top of the cascade as a foot bridge (as shown in the photos). 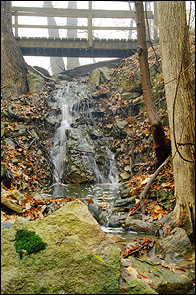 There are actually two more cascade waterfalls south of Upper Quarry Cascade, but both are located on private property in Burlington and are called Middle Quarry Cascade and Lower Quarry Cascade. It was on a trip to these three waterfalls that Joe and Montfield Christian discovered Quarry Falls in the centre of the old quarry and actually upstream of Upper Quarry Cascade. This waterfall was “discovered” by Paul Beneteau of the Bruce Trail, Iroquoia Section in 2006. He was checking out the Bruce Trail for maintenance and informed the Hamilton Waterfall group that he thought he had found a possible waterfall. 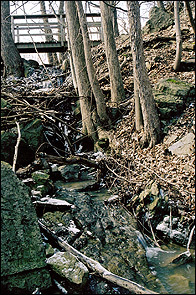 When Paul and Joe Hollick visited it in spring 2006, it was so covered in debris such as dead trees, branches etc, that it was difficult to see the actual waterfall. Joe requested that Paul and his Bruce Trail crew remove the debris so he could get a better photo of the falls. Paul was eager to do so and the other two pictures show that a little help from mankind can actually improve the appearance of a natural waterfall!